Theo Lubke, who until this fall oversaw the derivatives reforms at the Federal Reserve Bank of New York, said banks do not always think of the market as a whole as they help write rules. From his lips to God's ears. Banks are not good at regulating themselves. If the experience in the US was not enough take a look at Iceland and Ireland (for a start) to see what lax banking regulation means to the citizens of their country. But we are all at risk. The accompanying graphic shows the exposure we have to the derivitive market. Keep in mind that worldwide GDP activity is probably about than $70 Trillion per year. 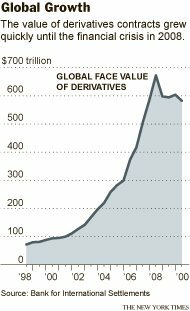 So derivatives are being issued at a rate over 8 times the economic activity they are designed to support. Now, keep in mind that GDP does not count purely financial transactions such as refinancing a debt (like a mortgage) which may generate a derivitive. That may explain some derivative volume beyond GDP but not at that level. As the article explains there are legitimate purposes to derivatives; helping firms hedge against a certain level of uncertainty with respect to future prices. So if they are dangerous what are the chances that Washington (or Brussels for that matter) will properly regulate the transactions? This article in today's Boston Globe gives us a hint. 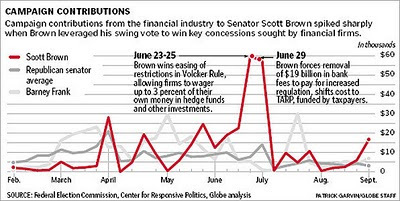 Apparently the financial services industry has gone "all-in" on the future of Senator Scott Brown (R-MA). The flow of campaign contributions to this one Senator gives you an idea of what regulators are up against in order to straighten out this market.